Exterior painting of your home or business requires the highest level of care and attention. At Pratt Professional Painting, we apply our knowledge and experience to get your property to look its very best. 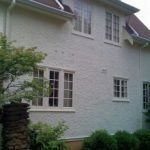 Exterior property painting is an easy and cost-effective way to ensure a warm look and feel, rejuvenating your home with your own individual design statement. Proper preparation and quality products will achieve a durable and long-lasting paint job. Bill Pratt will personally discuss your property’s materials – whether plaster, stucco, brick, or wood because different surfaces require different preparations and coatings. Following the best exterior house painting tips and using the best quality materials can add years to the life of the house paint before the need to repaint. Plus using top quality painting products, knowledge and practical experience will result in lower maintenance and less repairs in the future. Exterior painting will involve considerable time and effort and at Pratt Professional Painting, we stress work site safety and we go the extra mile to minimize disruption of the activity around your property.